Over the past few months Mary has been passing along to me her old copies of Cooking Light Magazine. I finally decided to go through them to find some cooking ideas. I’m trying to be scrupulous about whether or not I will actually make something that looks interesting to me before I tear out a recipe because the last thing I need is more recipes in my collection that I will never get around to making. Even so, I’m averaging 3 or 4 recipes per issue. So last weekend I decided I had better start cooking some of them. And with Operation Freezer Burn, it seemed like a good idea to try to pair up food I’m trying to use up with some of these new recipes I want to try. It’s been pretty cold here these days now that winter is finally here. 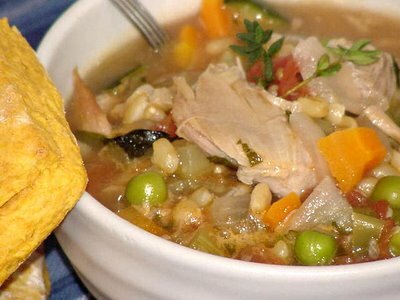 This is the time my thoughts turn to soup – a hearty and satisfying meal in a bowl that warms me up and sticks to my ribs. My Dad made a lot of soup, mostly turkey soup after Thanksgiving and Christmas. He would simmer the carcass over a fire as low as the burner would go without going out, and he would leave the pot on the stove overnight. My mother always complained about the way the smell spread throughout the house, but I kind of liked it because I knew what was coming. After that slow simmer of stock, he would start adding the vegetables. And he put anything and everything into that soup. Onions, garlic, carrots, celery, corn, green beans, kidney beans, lima beans, peas, and barley. I will always regret that I never found out what spices he used because they were fragrant and delicious without overpowering. I think it was most likely oregano, thyme and maybe a little sage. And he cooked everything over that same low, slow heat. By the time he was done there were several quarts of soup – some for eating and some for freezing. It was always delicious. He never used a recipe. And as I started my own culinary journey, I rarely used a recipe when I made soup either. I rarely have any turkey carcasses around so I mostly make chicken soup. And I am always experimenting with different combinations and spices. It's usually good; sometimes brilliant, sometimes not so brilliant, but it never comes out the same way twice. Every once in a while I see a soup recipe that intrigues me enough that I will decide to follow it. The Navy Bean and Bacon Soup recipe in the Good Housekeeping Illustrated Cookbook was a huge success. 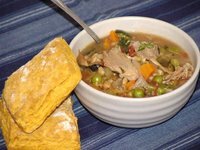 The Sweet and Sour Cabbage Soup recipe I got online from rec.food.recipes has become a regular rotation since I found it. As has Curried Red Lentil Soup. One of the things that's been burning a hole in my freezer is the leftover turkey I cooked up at Thanksgiving. I still have half a breast, all the dark meat, and a humongous carcass waiting to be used, so as I was looking through the recipes I kept the dark meat in mind, thinking I might find something I could make with that. And near the back of the September 2006 issue I found a recipe for chicken soup with groats. What are groats? Groats are whole oats that have the tough outer husk removed and are then toasted. I would show you a picture but I don't have any yet. All of my local grocery stores let me down and I will have to wait until I can make it to Whole Foods or maybe Fox and Obel to find some. But I didn't know that I wouldn't be able to find groats when I decided to make this recipe. I thought it might work well with the turkey. When I couldn't find groats, I decided wheatberries were similar, being whole grains and all, and bought some of those instead. I prepared them the same way the recipe called for the groats to be prepared, and they worked just fine. The turkey worked just fine, too. One thing that doesn't translate as well to the turkey as it would have for chicken is the amount of basil used in this recipe. I think it will be just fine with the chicken though, so if I ever use turkey again I would probably leave out the basil and add a little bit of sage. Bu I will probably use chicken the next time I make it. And I will definitely hunt down some groats. Although now that I have finally bought and cooked wheatberries, I will be doing more with them. They are delicious. Note: I substituted turkey for the chicken and wheatberries for the groats. I also used waffle-cut frozen zucchini chips; I let them defrost a little, then diced them. Combine 2-1/2 cups water and groats in a large saucepan; bring to a boil. Reduce heat, and simmer 45 minutes or until tender (do not overcook). Drain; wipe pan with a paper towel. This is the same recipe that I have been using to have in routine for the proper nutrients. This recipe is having all the nutrients which I have been intestinally needed after a good workout. Simple Turkish chicken has been cooked with the help of the correct and appropriate teems for the humans. The dynamics of the chicken have been improved with the support of the individuals and all humans for the appropriate instruments.